In fact, the song’s origins can be traced back to 1893 when a Kentucky schoolteacher, Patty Smith Hill, and her sister created a song to sing to kindergarten students at the beginning of the day. 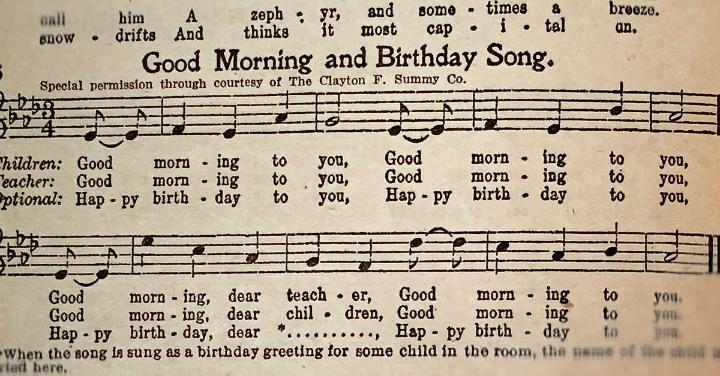 Eventually, “Good Morning to All” would be published in a book titled, “Song Stories for the Kindergarten”, and the publisher, Clayton F. Summy Co. was assigned the copyright from Hill and her sister. The same melody and similar lyrics were then turned into a birthday song titled “Happy Birthday to You”, which was also copyrighted by the same company. In 1988, Warner/Chappell Music bought Summy’s successor, Birch Tree Group, and they began enforcing the copyright that same year. Since those rights were established, it is estimated that this world famous birthday jingle has earned Warner/Chappell a whopping $50 million. So, next time you are serenaded with the birthday song and you blow out the candles on your birthday cake, remember to make a wish for copyright reform in this country. Because, an environment that encourages widespread innovation and creativity while discouraging such copyright injustices is the best birthday gift one could ask for.